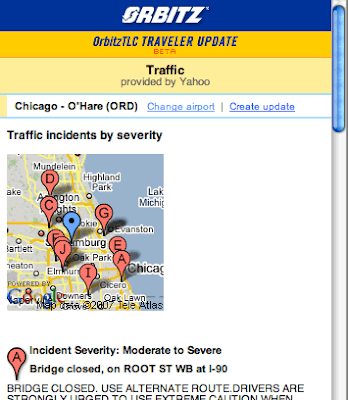 It is my pleasure to be asked by Pamela to write another guest blog post; this time to discuss my experiences in using the new Static Maps API to enhance our Orbitz TLC Traveler Update mobile airport traffic page. I am pleased to report that although the API is in its early stages, it provides enough functionality to easily convey valuable geo-based information (e.g. the top 10 severe traffic incidents surrounding an airport) for our mobile users. Ok, enough of the history lesson, click on the screenshot below to take a look at the Static Maps API in action. Originally when starting work on this feature, I of course wanted to use things like clickable markers, custom icons, and so on. But the thing to remember about mobile users is that they are on the go and have limited time to look at your map. Therefore it is best to keep the information as simple and bare bones as possible, as to limit the amount of time needed to interpret what they are seeing. Instead of custom icons, we used colors to contrast traffic markers from the central airport marker. We found the blue icon drew enough attention that it was the central focal, when surrounded by red icons (our traffic incidents). Additionally, the red color was enough to associate markers on our mobile version of severe traffic incidents with those found on our web site that uses a custom red triangle icon. Also by using labeled markers for the traffic incidents, and no label for the airport, we were able to further create a simple interpretation of traffic markers versus the airport maker. Finally, since most users are used to the alphabet markers signifying a list of similar points on things like maps.google.com, it was enough to help us associate the list of traffic incidents on the map with their specific traffic details located below the map. There were only two big concerns we found when creating this mobile map: icon size and lack of numbered icons. Since most mobile devices are phone-based, screen size (and thus map size) tends to be limited. As you can see in the example above, there are several times where the icons overlap and make the map look cluttered. If a smaller version of the icons were available, it could reduce the number of overlapping markers and make clear the position of the traffic incidents. Another issue with the icons is that the use of alphabet letters as labels has an inherent limitation, in that you can only place 26 different icons on one map. Because our non-mobile version of the traffic page can list over a hundred distinct incidents, we use numbers there to label those icons. If numbered icons were available for static maps, we could display additional traffic incidents on the mobile map. As always, the Google Maps API team and I welcome comments and questions on this article, the mobile feature mentioned, and the Static Maps API. Please leave feedback in the Maps API forum.